As Assistant Principal, Ms. Nash has a wide impact on the Burley community. She loves to get to know students of all ages and see them grow as people and learners -- not for just one year, but for the entire time they are at Burley. She coaches and supports our amazing staff, drawing on her many years as a classroom teacher, city-wide instructional coach, and mentor for National Board certification. Ms. Nash's favorite thing about Burley is the passion for reading that is nurtured and strategically developed in every Burley classroom. She is an avid reader and loves sharing books with students, especially those by her own favorite Young Adult authors, Neal Shusterman and Alan Gratz. 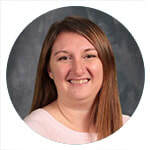 She values Burley's workshop model of instruction because it allows opportunities for students to try out, question, and refine their understanding of concepts and is the most supportive way of teaching. Her current professional influences include Maggie Roberts, Penny Kittle, and Kelly Gallagher. They focus on the next steps to take in workshop-style instruction and write for teachers in the middle school grades, whose unique and wonderful characteristics and needs are sometimes overlooked by other authors. Ms. Nash plays the piano and has since she was 4 years old. She LOVES to build things and has her own power tools and small workshop in her basement. She is married and is the proud mother to three amazing girls, ages 13, 10, and 8. After arriving at Burley in 2010, she taught 5th grade and then 7th before becoming our Assistant Principal. Ms. Nash loves documentaries and is obsessed with anything Ken Burns creates.